(Phys.org) —A study conducted by a team of researchers from Harvard, Wharton and MIT has revealed that venture capitalists prefer to back entrepreneurial opportunities when pitched by a man and that they are more likely to offer funding if the man is good looking. In their paper published in Proceedings of the National Academy of Sciences, the researchers describe research they conducted using real venture capitalists and video of real entrepreneurs to better understand why so many more male backed businesses receive capital investment funds than those founded by women. In the U.S., male run entrepreneurial efforts outnumber those by women two to one—perhaps more telling, businesses founded by women receive just seven percent of all venture capital funds. In this new effort, the researchers looked to gain a better understanding of why there is such a discrepancy. In their first experiment, the researchers recruited 60 actual investors from the business world as volunteers. They asked each to watch videos of people making pitches for a project asking for backing (from actual entrepreneurial contests held across the country). Afterwards the investors were asked to rate how persuasive they felt the people doing the pitch were, and also how attractive they found them. The research team reports that they found that the investors were more likely to choose the male pitchers over those who were female, regardless of whether the content of the pitch was nearly identical. They also found that the more attractive the person giving the pitch, the more persuasive they were found to be—but only for those that were male. The investors didn't seem to care how good-looking the women were, they rated them as less persuasive than their male counterparts regardless. In another experiment, the researchers used an online tool that allowed average people to grade the persuasiveness of entrepreneurial pitches where the listener could hear the pitch, but not see the person giving it. Once again, those doing the judging found the male presenter to be more persuasive than the female, even when the content was identical. In another similar experiment where the presenter was visible, the researchers found that "investors" were more likely to find a pitch persuasive if the presenter was both male and good looking. The researchers claim that their findings show a clear bias towards male entrepreneurial pitches exists among both business professionals and the population at large, particularly when the man is good looking. It explains why, they add, more funds are given to male endeavors than those pitched by women, but not why the bias exists in the first place. Entrepreneurship is a central path to job creation, economic growth, and prosperity. In the earliest stages of start-up business creation, the matching of entrepreneurial ventures to investors is critically important. The entrepreneur's business proposition and previous experience are regarded as the main criteria for investment decisions. Our research, however, documents other critical criteria that investors use to make these decisions: the gender and physical attractiveness of the entrepreneurs themselves. Across a field setting (three entrepreneurial pitch competitions in the United States) and two experiments, we identify a profound and consistent gender gap in entrepreneur persuasiveness. Investors prefer pitches presented by male entrepreneurs compared with pitches made by female entrepreneurs, even when the content of the pitch is the same. 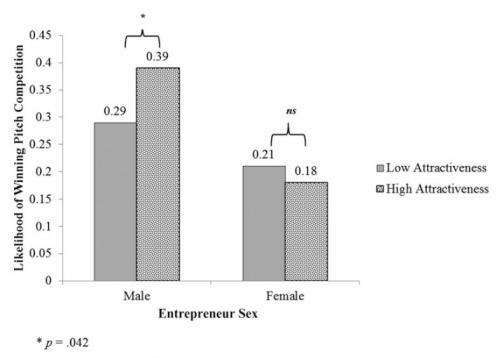 This effect is moderated by male physical attractiveness: attractive males were particularly persuasive, whereas physical attractiveness did not matter among female entrepreneurs. Its the same reason that we have celebrities briefing congress on things they've never actually learned, much less done. Its why HHS/OFA leveraged celebrities to pitch the ACA to skeptical public. IMHO, its because attractiveness is a component of "fitness" in humans, and thus we are more like to believe what "our betters" tell us.